05/05/11 - TONIGHT! Calexico Celebrate Cinco de Mayo With Jimmy Kimmel And an Appearance at The Echoplex! �A band has got to keep changing and moving or it will get boring and break up,� says CALEXICO�s John Convertino. Fortunately CALEXICO have barely stopped moving for nearly fifteen years. Even when they�re not on the road � and this band tours hard � they�re recording: for themselves, with others. It�s a tradition that Tucson, Arizona residents Joey Burns and Convertino � the engine that drives CALEXICO � have always maintained. To demonstrate this point, Quarterstick Records has assembled a 12 LP vinyl box set compiling all of Calexico�s previously tour-only, CD-only releases. The Road Atlas 1998-2011 vinyl box set also includes a 40 page book with extensive liner notes about each of the albums contained in the set. really special as well," says Calexico's Joey Burns. 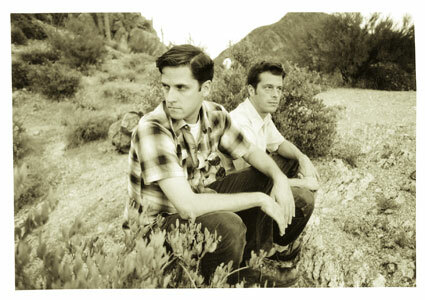 CALEXICO�s music has always mirrored Burns and Convertino�s penchant for new experiences. From their intimate beginnings on Spoke, their dusty but highly evocative debut album, they�ve never shied away from embracing whatever inspires them. The band has always admitted to being influenced by sources as diverse as Portugese fado, 50�s jazz, gypsy or romani music and its offshoots, 60�s surf and twang from Link Wray to country�s Duane Eddy, the spaghetti western epics of Ennio Morricone and dark indie rock singer songwriters like Smog, Richard Buckner, Will Oldham and Vic Chesnutt. As their horizons have expanded, through both their relentless touring schedule and growing reputation, they have been able to call upon a growing community of collaborators (including Iron & Wine, Nancy Sinatra, Neko Case, and many others), and an ever-increasing familiarity with music from around the world, integrating both seamlessly into their idiosyncratic sound. Ever since they were a largely instrumental duo experimenting with their unique collection of instruments and soundtrack sensibilities, Joey Burns and John Convertino have constantly imbued their music with an unparalleled sense of drama, calling upon the myths and iconography of the American West and its Spanish speaking neighbor Mexico, equal parts Sergio Leone, Larry McMurtry, Carlos Fuentes and Cormac McCarthy. Naming themselves after a town near the California/Mexico border in honor of this cultural m�lange, they�ve spent the eighteen years since they met in Los Angeles mapping out musical territory that had otherwise been neglected or at the very least considered the preserve of historians. They have defined that sound, calling upon almost two decades of exploration and an ensemble of musicians that must surely be the envy of bands throughout the world. CALEXICO now is very different to the duo that started out in 1996. These days CALEXICO is a band. Joey and John remain at its heart, but the multinational touring band they have gathered around them � fellow Tucson inhabitant Jacob Valenzuela, Germans Martin Wenk and Volker Zander, and Lambchop pedal steel player Paul Niehaus �also plays an important role.